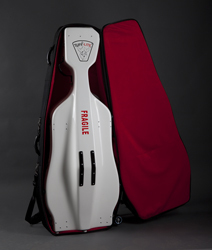 These special cello travel-flight cases are designed and used to fly with your cello and once at your destination can be utilized for everyday use. Tuff-Lite is known for their bass cases. Poor bass players never even have much of an option to actually pull their basses on board, but they are the experts at well made, lightweight and extremely practical flight cases. 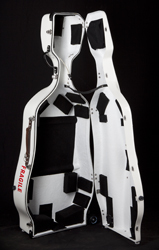 The Tuff-Lite Cello Case is made both with special pre-pregnated fiberglass which make them light and strong. Every nook and cranny on this new case is made and designed for durability, long hard use, light weight and affordability. The cases weigh between 19-21 lbs. There is also a specially made, thick coverall cover that eventually will come as an additional option, but included here in their special promotion. Why buy one of these cases? They're not light, like the Musilia S1, or like a super lightweight Accord case....so why get one of these? In the last 4 or 5 years there have been great strides and improvements made in the cello case field with regards to weight and materials used. These cases are necessarily heavier because they are meant to withstand the rigors of touring and rough handling. This case, is meant to be checked underneath the plane (with the luggage) so that one does not have to buy an extra seat or worry that the cello will be in one piece when it arrives at its destination. The cool thing about the Tuff-lite case is that it is made so well and so functional that you can use it for everyday use, not just the once or twice a year flights. So if you are flying to a festival for the entire summer, no problem. This case will do it all for you. Who buys these? Everyone! Students that go to those far and away summer camp, festivals, tours and/or all kinds of auditions plus the seasoned professionals as well we professional orchestras. (We had a college student last year that auditioned for 6 colleges and saved thousands of dollars by using this case.) Now that she is a full time student, she chooses to use her 6 lb BAM case for every day use to cart in between classes. In between semesters, she uses her Tuff-Lite when she flies home. Wheels? This case has the best wheels! 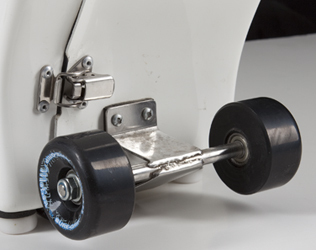 Specially made skateboard wheels. 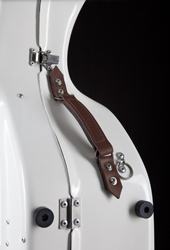 They are made using a special stainless steel bracket that allows the cellist to wheel the case on it's side and walk along with it. What's with that heavy duty padded travel cover? Is that what protects the cello or enables it to fly on the plane? The padded cover will eventually be an option to order. 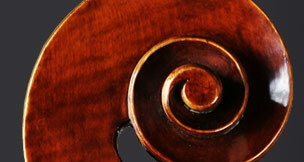 Tuff-Lite is adding this in as their complete package to help introduce their new cello cases and covers. The bare case (white) is made adn designed to use as a stand alone travel case. 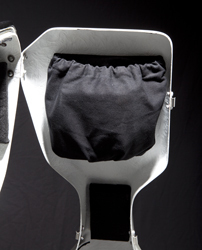 There are other cello case manufacturers that made covers for cello cases, but these don't make the cello case (within) stronger or more protective. The Tuff-Lite padded cover is a nice super thick, (dense) outer shell that will give even more protection, but what it really does is keep the hard case looking new, (no scuffs) and/or less outer shell wear and tear. Here are some photos. For more detailed info please see the Tuff-Lite Bass and Cello Fight Cases website.